It wasn't too long ago that the major pizza chains nationwide were Domino's, Pizza Hut, Little Caesars, and Papa John's. But a new wave of fast pizza chains are expanding quickly, and may one day supplant the marinara-covered giants of our past. Here's the strange thing: Even as pizza delivery is going super high tech (by Black Mirror-esque trucks), these new chains will cook your pizza lighting fast, but they mostly don't deliver. Despite that, they're likely the Domino's and Pizza Huts of the future. They all have a couple things in common: the pies are heated in super-hot ovens, meaning they're ready in a few minutes. You order a pizza similar to how you order a burrito at Chipotle -- you customize the pie by pointing at the toppings, which then get added to your pizza in front of your very (hungry) eyes. No matter how many toppings you add, the price (usually) stays the same. And they're all co-owned by LeBron James. Just kidding, that only applies to one of these spots. 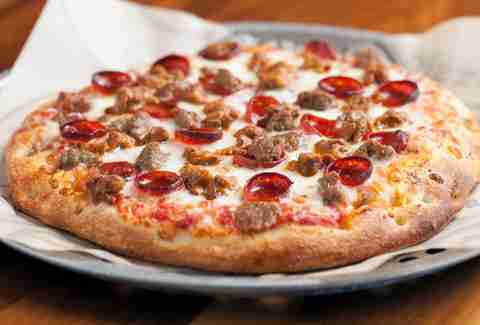 Here are the fast pizza chains poised to take over America. Sadly, Blaze is not a pizza chain owned by Blaze from American Gladiators. But it does have a another mega-celebrity behind it: Future NBA Hall of Famer LeBron James invested in the chain early on and reportedly owns 10%. Based on how damn good their pizza is (and the fact that his investment is worth significantly more today), he made a solid choice. The difference of a Blaze pie is the dough. It's made from scratch in every store, every single day. Let's just say you won't find always freshly made dough in many of the old-school pizza chains you grew up with. It results in an airy, buttery crust with a satisfying char after it's cooked in the oven for a scant 180 seconds. 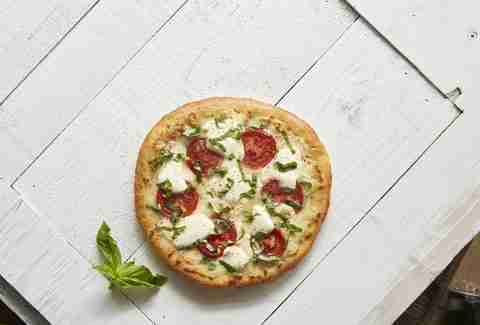 The signature pies and toppings don't stray too far from the typical pizza chain offerings, with the Meat Eater (pepperoni, crumbled meatballs, mozz, red sauce) and Green Stripe (pesto grilled chicken, red peppers, mozz, arugula) attracting fans. Don't skip out on a drink with your pie, as you'll find blueberry hibiscus agua fresca and blood orange lemonade among the options. Imagine you own this chain of coffee shops in the UK and you sell it to Starbucks. What do you do next? Retire? In real life, the husband & wife team who actually did that didn't sit on their (newly rich) behinds. 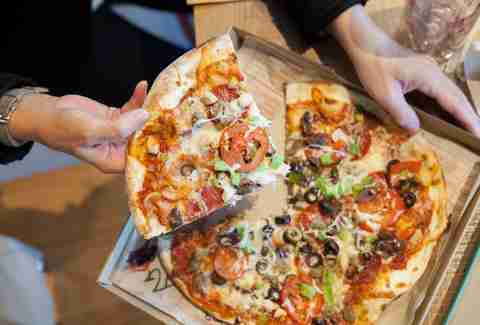 They created a fast-casual pizza chain in 2008, well before they were a thing in the US; since then, they've opened over 300 stores. The customizability of their pies is one way they differentiate themselves, giving pizza-hungry mobs the choice of 30 toppings, including an array of cheese (Gorgonzola, dairy-free), veggies (kale, artichokes, Greek olives), and meat (salami, spicy Italian sausage). Even the pizza dough can be tailored to your taste: while the 11-inch personal pie is the standard, a newish Mega Dough 11-inch thick crust is also available, in case you want your pie a little more Chicago. 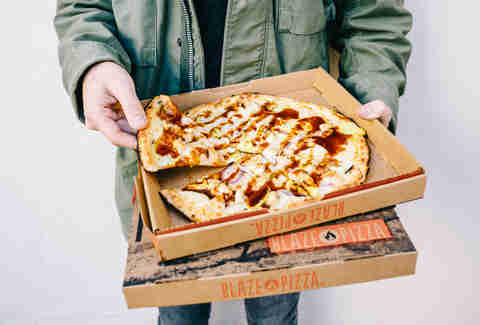 And while you might think that after you're done selecting a dough and toppings that your work is done, informed Mod lovers know that finishing the pizza with one of their nine sauces adds a ton more flavor to the proceedings, whether it's a fig balsamic glaze or Mike's Hot Honey. Bonus: When you buy their pie, you're helping a company which actively hires those who have been formerly incarcerated and people with disabilities. 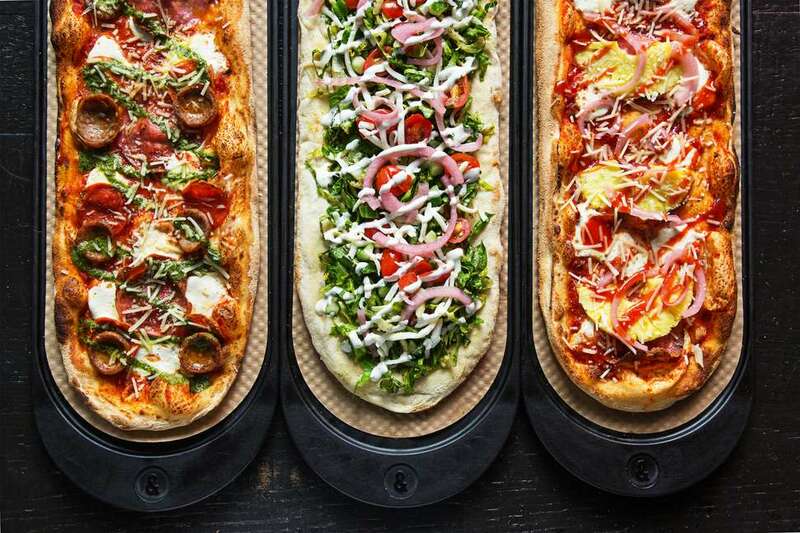 This LA-born pizza shop has some serious industry heavy hitters behind it, with a former McDonalds CEO and Buffalo Wild Wings both investing in the concept. Expect to see way more states serving its pies from a 900-degree stone oven in the near future. 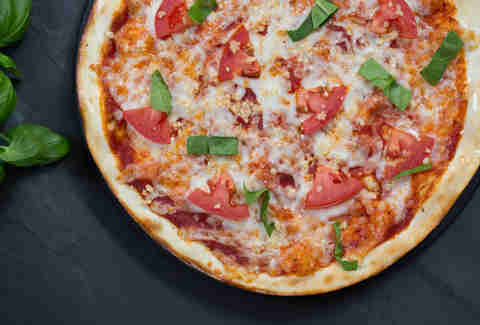 While PizzaRev features the requisite mountain of toppings -- sun-dried tomatoes, pepperoncinis, and even fennel seeds keep things interesting -- it stands out because of the way it caters to meat eaters, gluten-free folks, and vegans alike. For the protein-lovers, there's the beloved beef meatballs and spicy pepperoni. 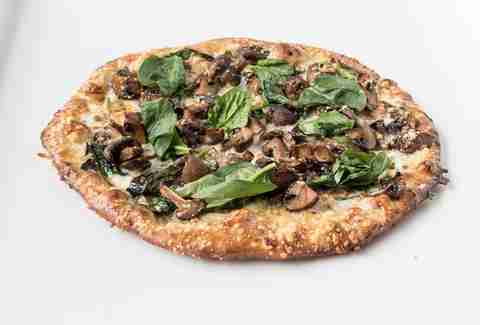 If wheat isn't your thing, snag like a gluten-free crust and 38 other toppings. For the animal-product-avoidant, choose from four of its sauces (from organic tomato to sweet & bold BBQ) and then top it with surprisingly melty Daiya cheese and vegan sausage. It's like a Choose Your Own Adventure, but there's a good ending no matter your dietary needs. Highlights from the chef-selected pizza options are the Rev'd Up Meat and Peppers, with the aforementioned beef meatballs, mozzarella with buffalo milk, Italian sausage, olive oil, and jalapeños, and the Mediterranean, a cheesy delight topped with Alfredo sauce, mozz, feta, spinach, artichoke hearts, and black olives. It may seem odd that we're featuring a restaurant with only seven locations in four states. But they only seem small if you don't know that this tiny chain is a partnership between the two owners of an award-winning, fine dining Italian restaurant in Boulder, Colorado (Frasca Food & Wine), and another small outfit named, uh, Chipotle. Locale originally opened up as a casual Italian spot with a focused menu of pizza and small plates. But the founder/former CEO of Chipotle Steve Ells was often dining next door at Frasca, and saw the potential for it to be Chipotle-fied. The restaurant owners agreed. Nowadays, stroll into a Locale, and you'll eat pizza made with dough freshly prepared in the store every day, and ingredients that scream quality: responsibly raised meats from Creminelli and La Quercia and Corto olive oil. You won't find pizzas here with unusual toppings: the signature pies don't stray far from Italian classics. There's a prosciutto and arugula pie, a smoked mozzarella, pepperoni, and chili option, and an absolutely decadent mozz, creme fraiche, ham, corn, and garlic pizza. Like a meal at Chipotle, you can always select your own add-ons and create the meal of your dreams. A burrito might be served to you slightly faster, but not by much: with its custom-made 900-degree oven, the pie cooks in only two minutes. Apparently fast pizza places can only be started by people who sell first their other business (shoutout to Blaze), because Uncle Maddio's is run by a co-founder of Moe's Southwest Grill. 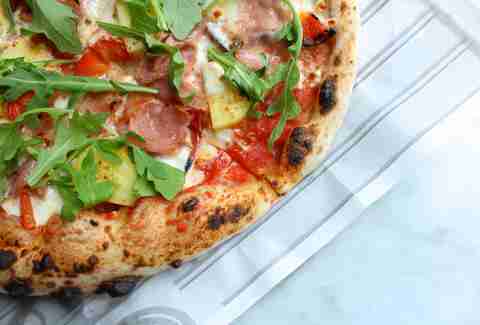 Back in '08, Uncle Maddio's says it was the very first create-your-own, fast-casual pizza shop in the country. They start with dough made every morning in each store, and your pie can be topped with 40+ selections that aren't exactly pizza shop standards: jerk chicken, pickled jalapeños, honey ham, black bean corn salsa, and grilled tofu among them. (We recommend selecting one of its 11 chef-created pies instead of putting all of those previously mentioned ingredients on one pizza.) But where Uncle Maddio's really thinks outside the bun is in the menu options other than its delicious pizza. Most restaurants in this list don't offer much more than personal pies and a few obligatory salads. Not here. You'll find Supreme Calzones packed with pepperoni, ham, and ground beef, and paninis named Foldwiches, which include a Caprese (grilled chicken, fresh mozzarella, tomatoes, arugula, pesto) and steak and cheese (grilled steak, mozz, banana peppers, red wine vinegar). Another differentiating factor? Some locations deliver. Gasp! How old-school of them! You want some wholesome origins? Pieology was inspired by family pizza night, where the founder, his wife, and kids would top their own pizzas, then presumably do something wholesome like watch a movie and send nice cards to their grandma "just because." But most family pizza nights don't have pizzas that pop out of the oven in less than five minutes, and they certainly don't offer up the insanely diverse combinations on offer here, starting with fresh-made dough, continuing to sauces ranging from red to herb butter and Alfredo, then offering the option seven cheeses and all the standard meats and veggies (nothing too crazy here). 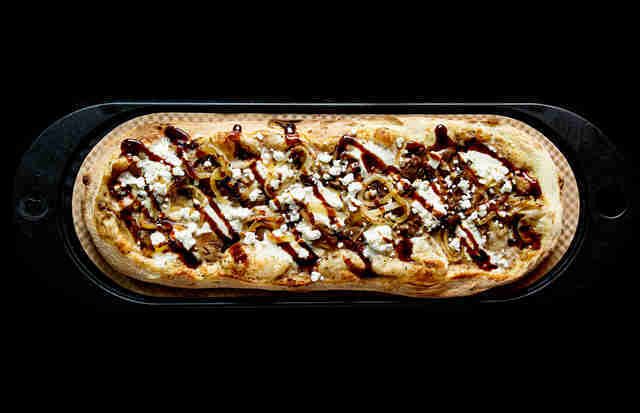 What's more, Pieology is a pioneer of the After-Bake movement, with additional sauces -- pesto, red, BBQ, and Buffalo -- available to drizzle on top, something many chains have now adopted with somewhat sloppy results. The same "point and it shall be" choose-your-destiny model also applies to the salads. All that's missing is a well-worn VHS of The Sound of Music to complete the Rockwellian dream come to modern pizzeria life. Just because you're fast doesn't mean you can't be fancy: &pizza manages to be both with aplomb, with its oblong, boat-snapped pizzas bringing some serious chef-ly flair. Yeah, you can get something simple and be happy here, but why would you do that when you're at a place where bases include French onion reduction; toppings include such unexpected delights as spicy chickpeas, croutons, and shrimp; and post-bake finishes run the gamut from sweet onion jam to hot honey, pickled red onions, and fig balsamic? This is a place that takes its pizza very, very seriously. That you get it in the same amount of time that it would take to score a burger at a place like Five Guys just adds to the mystique: Apparently, to create a pizza that utterly defies what you think pizza can be doesn't take a lot of time. Just a lot of imagination and a chef's touch. Crust is king at this high-end, fast-casual pizzeria, which takes great pride in its meticulous sourcing of ingredients. Hand-tossed and made in-house, they come loaded with rosemary, healthier with a flax seed/whole grain blend, and spicy as hell as the Firecracker. Sauce, too, comes in a wide variety, with the chipotle tomato blend really kicking that firecracker in the teeth. After that, you've got free reign on the toppings -- unlike some fancy pizza spots, you can load these suckers up with as much zucchini, shaved ham, chipotle-roasted corn, and truffle-roasted mushrooms as you like, though might we recommend getting them curate for you: Pies like The Beast, loaded with five meats on a Parmesan-flecked crust and the eight(! )-topping Skinny Greek with a tzatziki drizzle are still piled high, but with an eye toward quality in addition to excess. Regardless, what you're getting will be some sort of masterpiece, and one whose ingredients are chosen with a mind on quality, sourcing, and deliciousness. Lee Breslouer is a freelance writer and editor based in Colorado. Tweet him if he didn't mention your favorite fast pizza chain @LeeBreslouer.